Are you ready to start building your own food blog? Let me guess… you really love to cook, read about everything food related and keep talking about food to basically everyone you know? Those people are probably telling you that you should start your own food blog, your very own place on the internet where you can share your love for food! Learn how to start a food blog today! Start today! It’s totally possible and very easy to do too! All you need is about 15 – 20 minutes of your time by following our steps on how you can start building your own food empire! Before you know it you’ll be running your own food blog and be awesome at it! 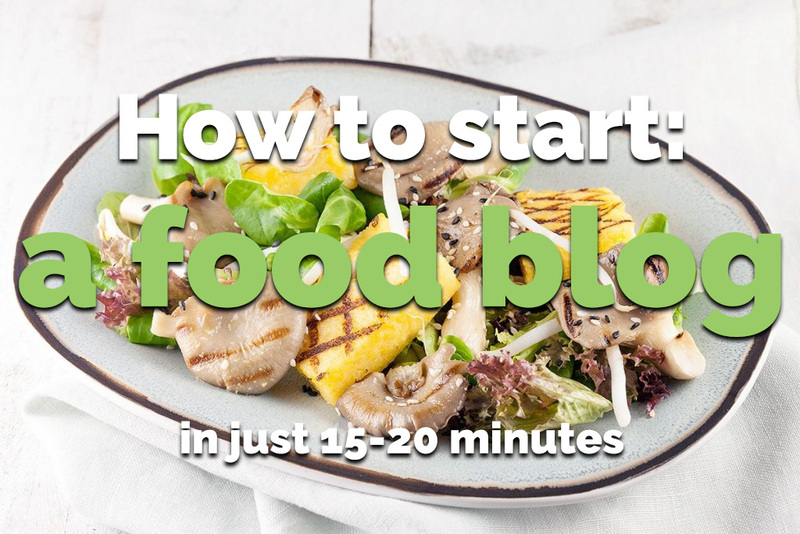 We’ve noticed that a lot of people are thinking about starting their own food blog, but are unsure on exactly how to start one. That’s why we’ve compiled everything you should know about starting your own blog on this page. Let’s get started! Hire someone to do the work for you. This is a costly way of starting your own site, but it’s a very good and professional option when you have lot’s of money to burn. Just make sure you ask for references of your web designer before writing any checks. We’ve built this food blog from scratch too and it didn’t cost us very much, and we’ve used the tools mentioned in this guide. You can of course host your food blog for free if you want to, on domains such as blogspot.com, blogger.com or wordpress.com, but we highly recommend signing up with Bluehost to get your own hosting and very own .com domain name! myawesomefoodblog.blogspot.com just doesn’t look as professional as myawesomefoodblog.com, don’t you think. Start your own food blog today! Using a free service in the beginning does give you the time to grow your audience and develop a strong voice before investing any major money, since they are easy to set-up and develop. Biggest disadvantage is that you cannot use all of the available tools that are out there to build your audience even faster. Most of these services limit you in the way you can use and edit your site’s template. This usually results in having a food blog that looks very similar to 100 others. In this article we’re going to assume you are going to register your own hosting and domain name using Bluehost’s service. Step one: domain name and hosting. Personally my favorite part of starting a (food) blog, deciding what to call it and registering a domain name. Think about it for a while, grab a pencil and notepad and write down 10 names that really appeal to you. 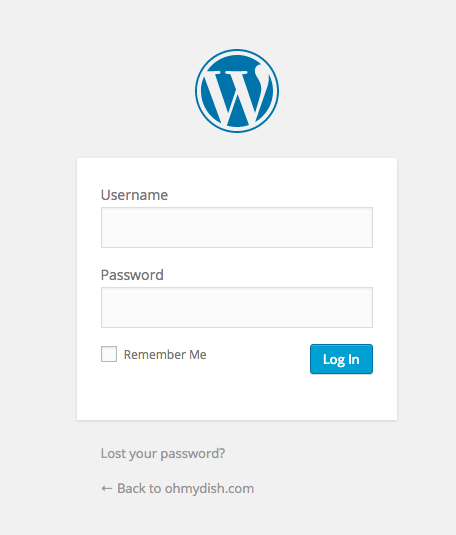 A domain name can be composed of various words, like ours: ohmydish.com is a mashed up word of oh, look at my dish! Fun, right? Here’s what worked for us: we wanted to start our own food blog, so we obviously would need a good name. We sat down and wrote down 10+ domain names that we really liked. Once we had compiled a list of potential domain names we filtered out the ones that didn’t really stand out. We had about 5 names left on the list after that. Head down to Bluehost and check if your domain name is available by entering it into the search box below or by clicking on this link: register your food blog domain name. When asked about a plan level, select the cheapest option: starter plan. This plan is great when making your first steps into the food blog-o-sphere. Next step is to fill in your domain name, we’re going to use the fictional domain name myawesomefoodieblog.com. Great, now that you’ve made it this far, let’s fill in your personal information. 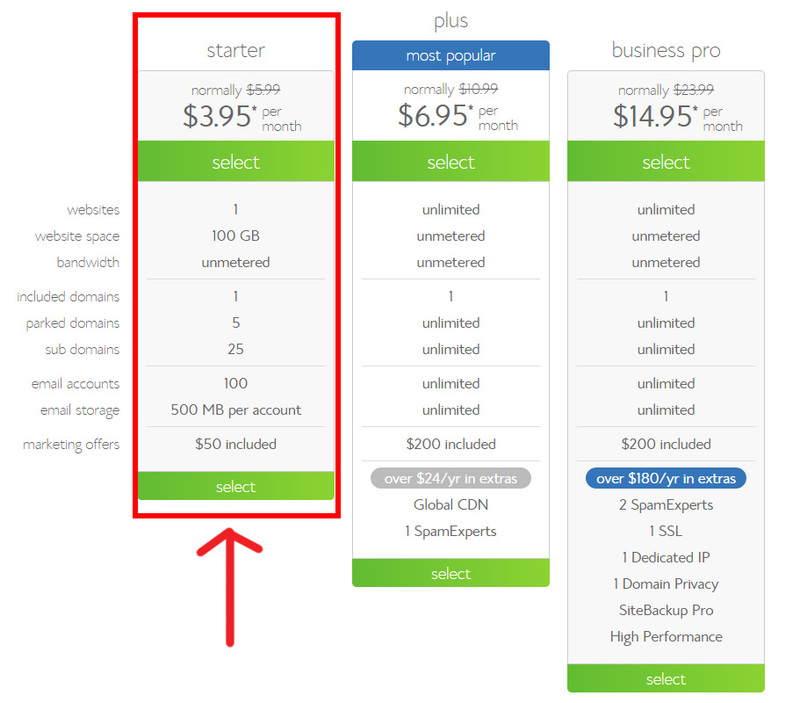 Then choose whether you want to shield your domain registration information to the public. This is checked by default next to the option “Domain Privacy Protection”. 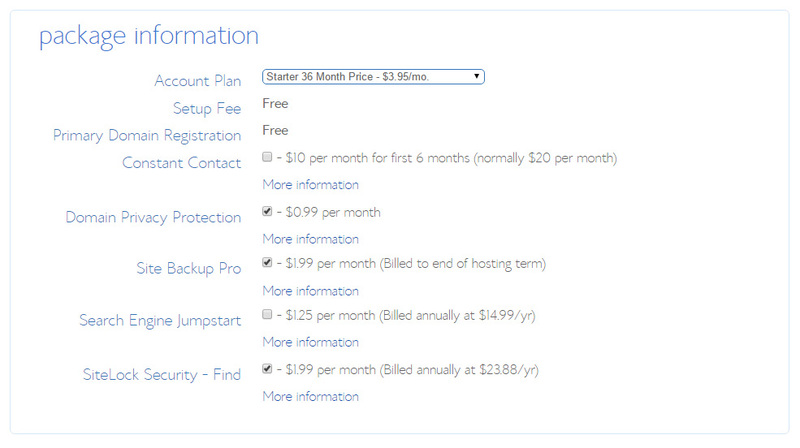 You can check out the other options too: site backup pro, sitelock security and search engine jumpstart. We recommend leaving these as they are. Once you’ve completed your registration with Bluehost, you’ll need to go trough the process of installing WordPress. But first: congratulations! You are now the proud owner of your own domain name and a place to put all of your online files. Let’s get working on installing WordPress! Before writing any blog posts, recipes and choosing which theme you like, we’ll need to install WordPress first. This is very easy to do using Bluehosts’ MOJO marketplace. The MOJO marketplace is a program that makes it very easy to install third-party tools and scripts –such as WordPress— onto your Bluehost website. So let’s get started! You can follow the instructions below, or check out the video above to learn how to install WordPress using the MOJO marketplace. Click on the button that says “One-click installs”. To install WordPress, simply click on the “start” button in the MOJO marketplace tool. 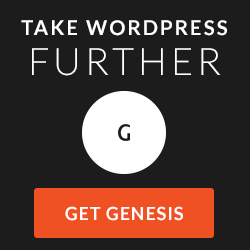 Now choose the domain name you want WordPress to install onto. You can also choose to install WordPress into a sub-folder, but just keep it as-is because we want the WordPress installation to be installed as the primary (food) blogging platform. Edit your e-mail address, username and password when asked for the new WordPress installation. You can change these settings when you choose “advanced options”. The final step is to read trough the license and service agreement and check the box to agree. Click on the “install now” button to start installing WordPress on your website. Once you get a message telling you that “Your install is complete”, click on the “View credentials” button and write down your admin url, username and password. These are the credentials you need to login on your food blog later on. This part might be a bit confusing for those that have never installed WordPress before, just take your time and read trough this article again if you’re not sure about something. You can use the comment form on this page to ask questions too! Step three: installing a WordPress theme. Now log in using the credentials you’ve writing down before, and you’ve officially logged into your own blog. Congratulations! Wohoo! How does it feel? Welcome to the world of food blogging! You are now very close to being able to share that super delicious recipe for home-made chunky chocolate crumble cookies with the world (Please send any samples to ohmydish!!). The Thesis Theme — This is a widely used theme that many professional food bloggers use. We really like it and highly recommend it. Elegant themes — This option is cheaper than the previously mentioned themes, without compromising on useability, features and looks. 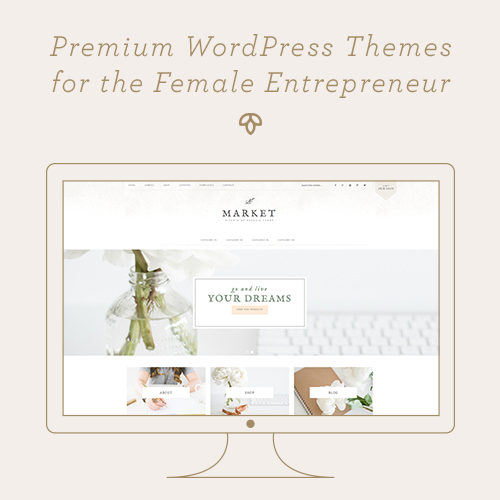 Elegant themes have quite a few different options too, just check it out for yourself ! You are good to go, once you’ve chosen from which theme you want to start your food blog from. The next big step is to learn the basics of WordPress. This means you’ll need to know how you can publish articles, recipes, upload photos and placing widgets on your food blog. Congrats, you are now a food blogger! YAY! Start blogging and publish those recipes, stories, reviews and posts! Oh, and did you think this guide was handy? Let us know by using the comment form on this page, we would really love to hear your success story! If you’re REALLY cool (and we know you are!) then you’ll set-up Google tools after creating your food blog. All you need is a Google account and 15 minutes of your time. If you don’t have a Google account you can use this link to sign up for a free Gmail account. Google Analytics — Probably one of the most important tools you’ll ever install for your food blog. Google Analytics helps you keep track of your blog’s traffic. Once you’ve signed up for Google Analytics, install Yoast’s SEO WordPress plugin and configure your tracking code there. You can also search for the plugin in the plugins section within your blog. Webmaster tools — Another valuable tool from Google. This makes sure everything is working fine, it’ll keep an eye out for any errors there may or may not occur down the road. After signing up for webmaster tools it will look empty. Just come back after a week or so for your first results. Now that you’ve set-up the most important Google tools, let’s install free WordPress plugins to kick-start your food blog. Each of the below WordPress plugins add valuable functionality and features to your food blog, these usually don’t come with your theme. AddThis — This is one of the most popular free social bookmarking tools available. This WordPress plugin adds buttons to pin, like and share your recipes at the bottom of each post. Akismet — Hands down this is the best free anti-spam plugin for WordPress out there. It will filter out spam comments without requiring your visitors to fill out a CAPTCHA. You’ve seen those before on websites, it’s a box with distorted words. I find CAPTCHA to be a nuisance, so not requiring your visitors to fill one out is super awesome. Easy Recipe — This WordPress plugin is essential when building a food blog. Easy recipe formats your recipes for SEO (Search Engine Optimization). It basically means that your recipes will be found much quicker in Google (and other search engines) rather than waiting for Google to figure out what type of content your post contains. jQuery Pin It Button for images — Gives your visitors a very handy Pinterest button to pin your stunning food photos with. Plus its super easy to set up! WordPress SEO by Yoast — We’ve mentioned this plugin before and we highly recommend installing it to give you a guideline on how to improve your SEO. SEO can be confusing and complicated, so a push into the right direction really helps. It takes a while to get used to it, but stick to it and you’ll surely notice your SEO improving over time. It can also be used to set-up Google Analytics and Google webmaster tools, so make sure to check it out! It will totally be worth the effort. There are so.many. WordPress plugins available these days, we simply cannot cover every single one of them. Let us know if you are using a WordPress plugin that should be on the above list. Note: This post contains affiliate links. We only recommend services and products we really like! Thank you for your support!